The mission of the Missions Ministry at Woods Church is To share the word of Christ and put His love into action by engaging the congregation to serve and advocate for those who are marginalized and in need. There are numerous ways to get involved and we encourage everybody to participate. Below you will find opportunities with our mission partnerships. 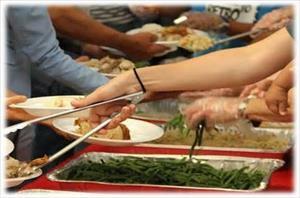 Serve our neighbors experiencing hunger a hot lunch the 1st Thursday, 3rd Monday, or 4th Saturday of each month!